Windows Small Business Server 2011 supports installing using an answer file. You can use an answer file to automate both clean and migration mode installs. To perform a migration mode install you MUST use an answer file. To allow administrators to easily create an answer file SBS 2011 includes an answer file generation tool (SBSAfg.exe). This tool is very similar to the tool included in SBS 2008. You have many options to launch the tool. You can insert the SBS 2011 DVD into a machine and let it autorun. You will be provided with the following menu from which you can click the Create an answer file link. 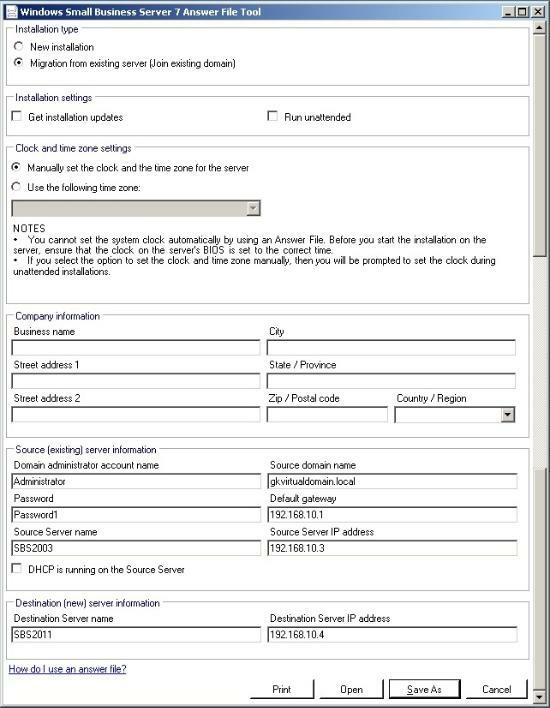 To migrate a domain to SBS 2011 you must first run the Migration Preparation Tool on the source server of the domain. Once the tool has been run you can launch the tool from the finish page by clicking the Create an answer file link. You can also run the answer file directly from C:\Program Files (x86)\Windows Small Business Server 2011 Standard Migration Preparation Tool\SBSAfg.exe once the Migration Preparation tool has been installed. Launch the answer file generator tool by using one of the methods mentioned above. Select New installation or Migration from existing server (Join existing domain) depending on your scenario. Note: the tool will default to new install. Enter the required information. See below for a summary of each field. Note: you cannot user any filename other than sbsanswerfile.xml. This is the only filename that the SBS 2011 setup will look for. Copy the answer file to the root of a USB drive, floppy disk or a partition on the destination server. Then start either installing or migrating to SBS 2011. If the SBS 2011 installation wizard detects a migration answer file, the migration process starts automatically. The SBSAfg.exe tool can be downloaded here. This has been taken from SBS 2011 media. Please verify the integrity of the file using the hash information below.